But Justin was... daring. Exciting. More beautiful than I could dream. To be honest, I was a bit wary when I started reading the story. A nearly 600 year old vampire pulling off returning to modern day highschool? It seemed overdone, and I awaited *facepalm* moments to be revealed. However, the way Rebecca Maizel tells this tale makes it feel much more heartfelt and real than I would have expected. In the world that Maizel created vampires' nerve endings are dead, one of the first things Lenah notices when she wakes up human is that she can actually FEEL the wood beneath her fingertips. It's texture. Unlike when she was a vampire and she could feel it's presence, but nothing more. Having not experienced things as a human for so long, it was fun to watch Lenah really LIVE. To experience things like they were firsts again. Who wouldn't want to relive some of their firsts? Food, love, even something so simple as feeling the sun on her skin. It was amusing at times. Heartbreaking at others. Infinite days does not always give the warm and fuzzy feelings. I mean there are plenty of those, but throughout the course of the book I honestly felt it all. I laughed, I got angry, I grinned from ear to ear and swooned.. and I Cried. The flashbacks throughout the story were perfect. Showing readers how Lenah has truly changed over the ages. From Sweet and innocent human, to newbie vamp.. Then brutal and terrifying.. and then human again. Still carrying memories of her vampire self, but trying to be better. Trying to earn the second chance she has been given. Tony: Lenah's new best friend. Artsy and a bit on the quite/geeky side. Justin: The popular guy vying for Lenah's attention. Drawn to her awkward innocence. I found myself torn when it came to Justin. Both enjoying what his character brought out in lenah, and being worried that he was just going to break her heart. And then you have the " Triplets": Annoying, Preppy and pretty much seems like they have no mind of their own. Doing whatever seems " in". BUT is that all there is to them? Or is there more beneath that follower exterior? Infinite days is rich, exciting and beautiful as well as dark. Giving a bit of a deeper look into vampires in YA. This is not just a story for one " fandom". If you like Twilight- Great! Infinite days has romance and teenage angst. 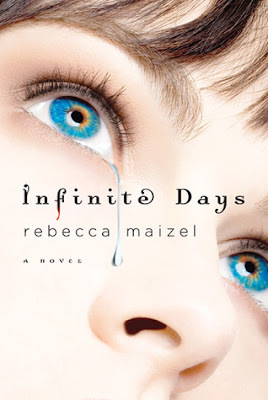 If you don't like Twilight and think and think all YA vampire stories nowadays are "fluff" Try infinite days and see if it proves you wrong. - For those of you thinking " just stop comparing everything In YA to Twilight!" I get it. I'm simply referencing it because... well.. it's well known. It's easy for some readers to relate. I could also say - Anne Rice Vampires as modern day teens! Basically. Just try it. It freaking rocked.